The predictions and hot takes are streaming through social media as we approach Round 1. But according to the bookmakers, the 2018 NRL season is going to look awfully similar to 2017. Seven of the eight teams that played finals football last season are in the top half of the premiership favourites odds for 2018 while the strugglers aren’t expected to get much better. Here, we take a look at every team, where they might finish, and which markets to consider when making your preseason tips. As is the case most years, the public is doubting the Brisbane Broncos. Kodi Nikorima’s credentials as a first-choice five-eighth are one of the loudest preseason talking points for punters. However, Brisbane did win 11 of the 13 games he started at the position in 2017. The young Kiwi doesn’t scream premiership-winning half, on the other hand, he’s good enough to get the Broncos into the Top 4 ($2.70). New coach, new players, new gameplan, new board. A lot needs to go right for the Bulldogs to challenge the Top 8 ($2.90). For a start, they need Kieran Foran to fire. After his lacklustre season with the Warriors in 2017, though, you’d be brave to bank on it. There’s potential for good things given the quality in the forwards, but without the backline to finish off moves up the field, they might not have enough points in them to compete. Will we get the second-placed 2016 or tenth-placed 2017 version of the Raiders this season? However, what we do know is they will score plenty of points. Despite finishing 10th, only the Broncos and Storm scored more points than the Green Machine in 2017. With that in mind, Jordan Rapana to be the top try-scorer at $11 is where to find value in this mob. 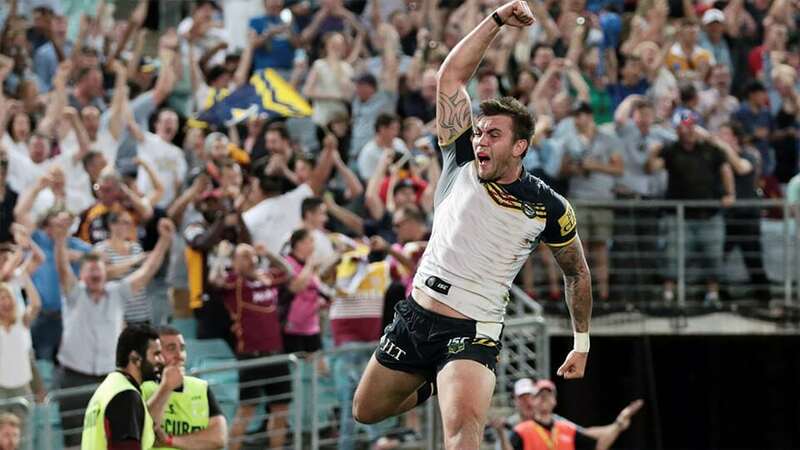 The Matt Moylan for James Maloney swap along with the welcoming of Josh Dugan in place of Jack Bird offers up more questions than it does answers. There’s no denying the potential of this Sharks roster, but it will take a month or two before you can tip them as premiership contenders ($15) with any confidence. All we can be sure of with this team is they make the Top 8 ($1.40). Last season was a nightmare for the Titans and it’s only looking like it will get worse. At $3.50, they are joint-favourites to end the season with the least wins. After finishing 2017 with seven wins, they’ll struggle to beat that number with the teams around them on the ladder all improving at a greater rate. The Sea Eagles expect to play finals football again in 2018. To do so, they will need to cover the loss of Blake Green more than anybody expects them to. Lachlan Croker has been tasked with filling the void and should he greatly overachieve while adding to his one career first-grade game, $1.90 to make the Top 8 starts to look good. At $5.50 to win the premiership, it’s looking like the Storm won’t take a backwards step despite losing Jordan McLean, Cooper Cronk and Tohu Harris over the summer. If their thrashing of Leeds in the World Club Challenge is anything to go by, they won’t miss the trio at all. Craig Bellamy will have this team primed and ready to challenge for back-to-back premierships come September. Provided injuries don’t hamper them too much, $5.50 might be as good as it gets for punters in 2018. Expectations for the Knights are high in 2018 – too high. Their squad is still young and outside of Danny Levi, their spine players are all preparing to debut for the club in Round 1. Let’s give Nathan Brown a minute to work things out before demanding they go straight to the top. It’s going to take more than an offseason to propel the three-time wooden spooners into the Top 8 ($2.45). When people least expect it, the Warriors tend to surprise. As they continue to be written off, the influence of Blake Green and Tohu Harris is yet to be seen. If Green can bring his professionalism and gamesmanship, and Harris his premiership-winning pedigree, it’s not totally unthinkable that the Warriors make the Top 8 ($3.80). Although, after six final-less seasons, recent history isn’t on their side. The beaten finalists pinched Jordan McLean from the Storm and will also welcome back Johnathan Thurston and Matt Scott to a squad that’s already proven to be one of the best in the competition. As the Cinderella story of 2017, they have a better chance at a happy-ending this season starting with a minor premiership ($6). With the other contenders depleted during State of Origin, the Cowboys will have Thurston and Jason Taumalolo available to guide them through to a few extra wins. The Eels were blessed by the schedule-makers in 2017 playing the 11th, 12th, 13th, 14th and 15th placed teams twice. The harder 2018 schedule is reflected in Parramatta’s $13 odds to win the premiership. With a handful of teams ahead of them in the pecking order, they would only need the Roosters to slip up to be the highest finishing NSW team ($6.50). The Panthers’ slow start in 2017 proved to be too much of a hurdle to leap despite being one of the favourites heading into Round 1. At $12 to be crowned premiers, they are further down the list in 2018 but pose as a legitimate threat should everything go as planned. One thing will define their season more than anything else, though: how Maloney gels with Nathan Cleary in the halves. Throughout the opening nine rounds of the 2017 NRL season, the Dragons jumped between first and second on the ladder. As far into the season as Round 13, they were third. From there, they became one of the worst teams in the competition to end up on the outside of the top eight looking in by Round 26. We saw what they were capable of in the first half of last season. If they can regain that form and keep it for the year, $18 to win the premiership is where to go for your roughie. Injuries derailed South Sydney’s 2017 season but should they remain healthy this year, a team featuring Greg Inglis, Dane Gagai, the Burgess Brothers, Adam Reynolds, Angus Crichton and Cody Walker can’t be ignored. The Rabbitohs are on the eighth line of premiership betting at $17. However, at $1.85 to make the Top 8, there’s value in banking on the core group staying healthy. If they do, anything can happen. After finishing 2017 second on the ladder, the tri-colours welcome Cooper Cronk and James Tedesco to an already stacked side. Even before adding the quality of Cronk and Tedesco, the Roosters had made a habit of making it a game short of the Grand Final in recent years. They might take another year to go to win the premiership ($5.50), but they are at $2.70 to go one game better in 2018 and make the Grand Final. The Tigers lost some quality in James Tedesco, Aaron Woods and Mitchell Moses, but Ivan Cleary’s recruitment drive has gone a long way to filling the void left by three-quarters of the ‘Big Four’. While they will undoubtedly improve, it may not show on the ladder. The blowout losses will be few and far between, but for a club so accustomed to losing, it will take time for them to figure out how to win again. They will look better, although, there’s a good chance they still end up with the least wins in 2018 ($3.50). They aren’t the favourites right now, but the Cowboys at $6 is the preseason value tip. After navigating the middle months of the 2017 season to sneak into the eight, we saw the Cowboys at their best during the finals. Michael Morgan came into his own and is now joined by an all-time great in Thurston. Taumalolo ran over anything that moved on his way to the Grand Final only this time, he will have McLean and Scott there shouldering some of the load. North Queensland thrived on the Cinderella story narrative at the back end of the year; they proved everybody wrong for weeks before falling short in the decider. The story in 2018 could be different with Thurston retiring, though. A Kangaroos, Queensland and North Queensland great can leave the game on the highest note.